To be very honest: his special find made me a little bit jealous. At the same time, I realized how rare such a phenomenon actually is and how pointless to go out and look for one. So of course we started our Pink-Grasshopper-Mission. With literally thousands of green brown brothers jumping around, I felt like I was looking for a needle in a haystack. And just when I was about to give up, I noticed something pinkish! I had found a Pink Grasshopper myself! He wasn’t very cooperative and despite his striking color he managed to escape within no time. But boy, was that cool! 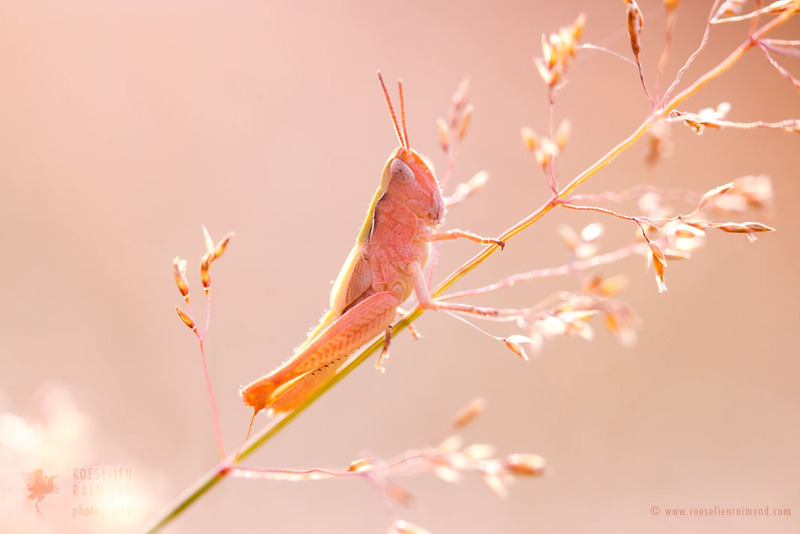 Only little is known about pink grasshoppers, except that the color deviation is likely to be caused by the lack of black pigment (eumelanin) on one hand and on the other hand an excessive production of the red pigment (phaeomelanin). This phenomenon is called erythrism and is defined as an unusual reddish discoloration of fur, hair, skin, feathers or egg shells. The combination of red hair and freckles in humans is thought to be a form of erythrism, too. Erythrism is defined as an unusual reddish discolouration of fur, hair, skin, feathers or egg shells. Albinism is characterized by the complete or partial absence of pigment in the skin, hair and eyes, resulting in partially or completely white hair or fur and red eyes. In leucism the melanin is, at least partially, absent but the eyes retain their usual colour. Melanism is the opposite of albinism. An unusually high level of melanin pigmentation results in an appearance darker than non-melanistic specimens from the same gene pool. Some theories claim that the gene for the pink color would be dominant in locusts, but that they simply don’t reach maturity due to the vulnerability that comes with this pink color. In a predominantly green area, being pink obviously is no benefit. Another theory assumes that the pink gene is recessive. Two parents with a latent pink gene are needed, to create a pink baby grasshopper. Of course it’s thinkable that the color pink would provide an advantage. Like -for example- in a field of pink flowers. In a case like this, the pink version would have an advantage over his green brothers and theoretically this could result in an entire pink population! Imagine how happy would you be when you found that one very rare green one! What a pretty pinky little grasshoper! I learned something new today! Thank you! WOW! never seen a pink grasshopper every before.